I discovered this marvelous Parisian tradition quite by accident. I was on a two-day whirlwind tour of Paris in July, 2011, and we happened to take a ride on the Bateaux Mouches. This was my second time to travel along the Seine (the first being in 1977 on a high school exchange program), and while I never tire of the Parisian landmarks, I thought I knew what to expect. That was not the case. I adore everything about this new tradition. 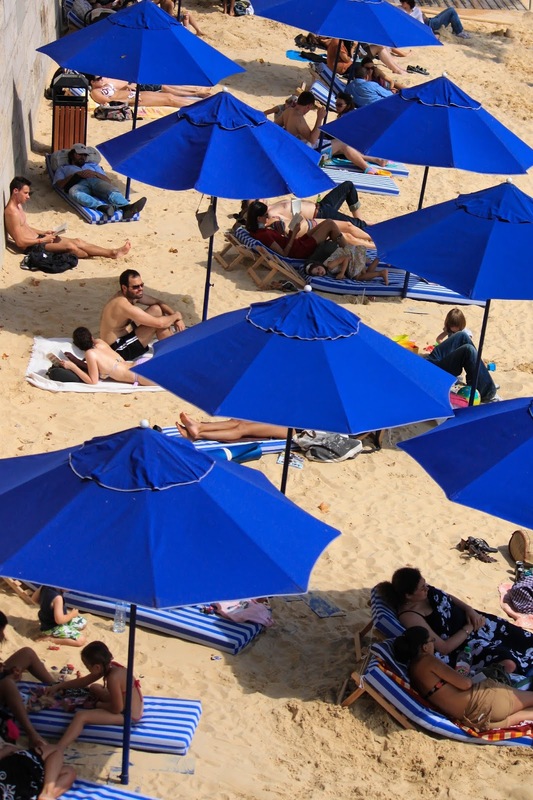 The colorful umbrellas and coordinated chaise lounges immediately connote images of Parisian style. Families with young children mingle with millennials and co-eds. Relaxation is evident, and the hustle and bustle of the big city is almost non-existent by the water’s edge. 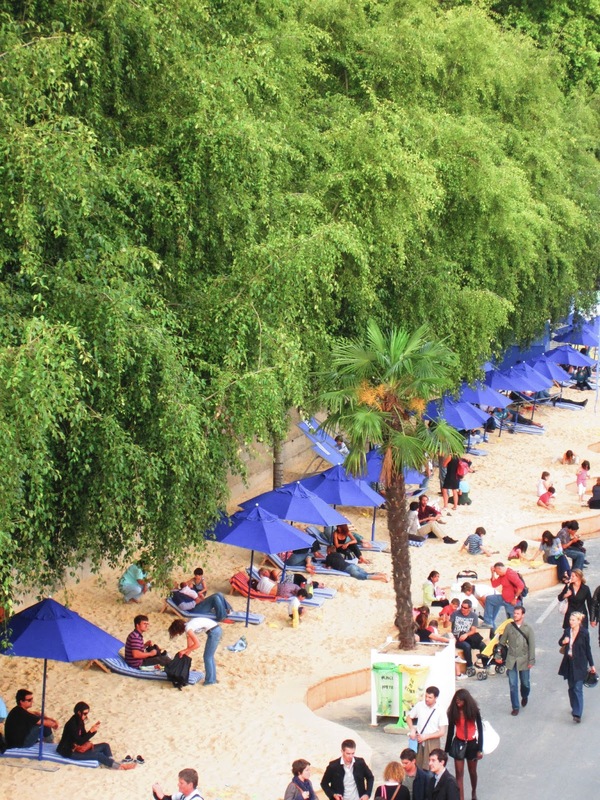 One look at this photo and one would guess St Tropez… not Paris. I’m not sure how much sand is trucked in for this event, but it must be TONS. Thousands take part in the festivities each day, but the city does an amazing job of keeping everything pristine clean. Each morning the chairs are neatly arranged, and the sand is freshly grated. 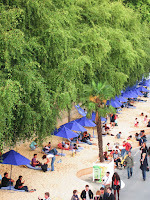 While most visitors prefer to sunbathe and relax under the temporary Palm trees, there are activities to keep the young – and young at heart – engaged. 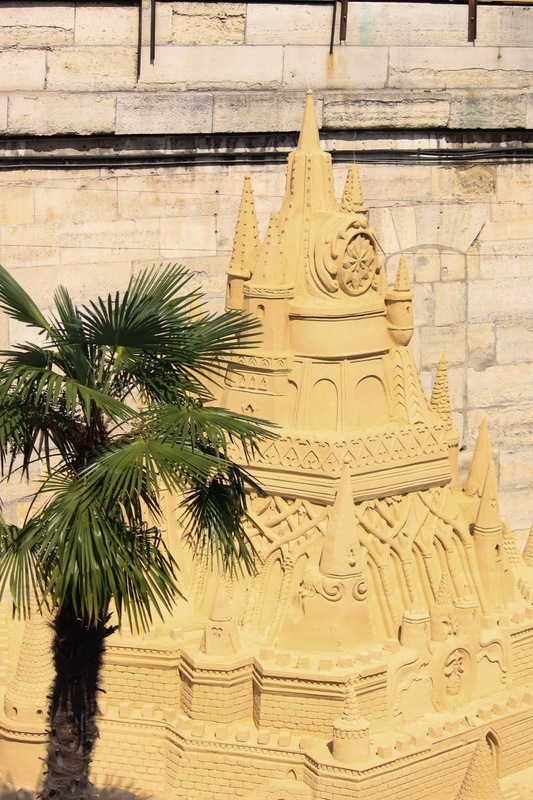 There are some true sandcastle artists, and we all enjoyed the fruits of their labor. Some creators took a more classic approach – like the one shown here. Others were more whimsical, like the Mickey and Minnie Mouse characters in front of Cinderella’s castle. And then of course, there were the old childhood favorites, made with various sizes of plastic pails and shovels. 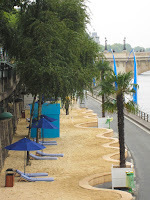 On this last trip I noticed the beach-theme extended beyond the banks of the Seine, up to the Hotel de Ville, where Parisian sports enthusiasts could partake in a game of sand volleyball. 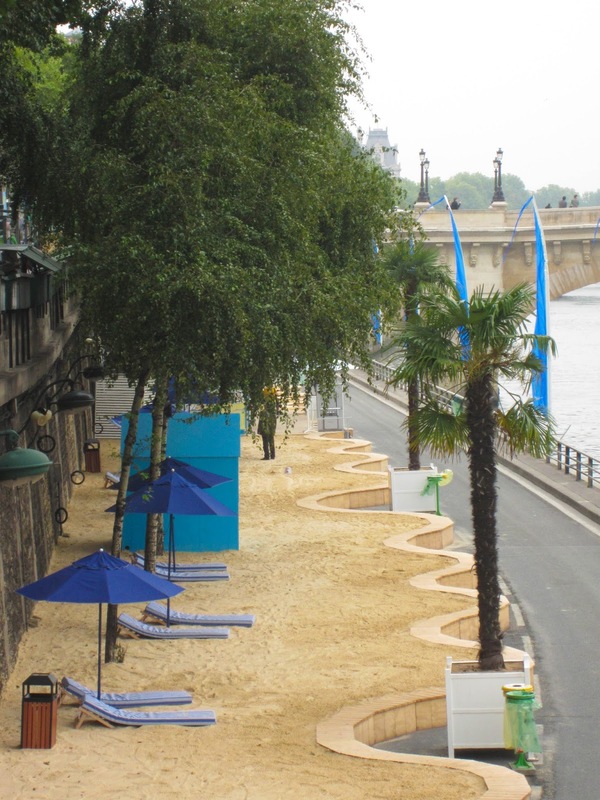 I enjoyed Paris Plages from afar: admiring the scene from the bridges rather than experiencing the sand between my toes. But it still brings a smile to my face. Such a whimsical scene in the midst of the world’s most cosmopolitan city. 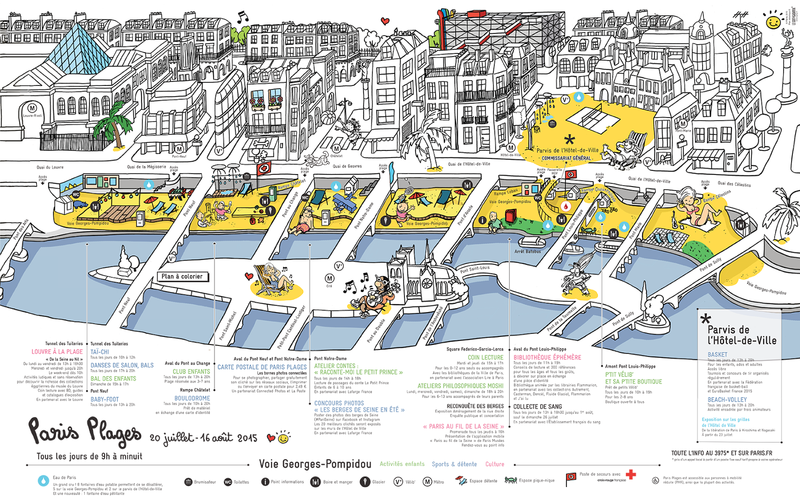 Paris Plages lasts about a month, starting shortly after Bastille Day and running through the middle of August (2015 dates are July 19-August 17). If planning a summer vacation to Paris, consider going during this time frame. While the weather may be warm, this unique experience is well worth it. I loved learning about this today! What a surprise in the midst of a busy northern city. I can dream, Molly. I can dream.